Caught in a pickle? Have too many beets? Why not pickle your beets! This is recipe from the Washington Post that comes in handy when beet production is at its highest. Have ready 7 pint-size mason jars with 2-piece lids, a large canning kettle full of barely bubbling water and a medium saucepan of hot water. Immerse the jars in the kettle and immerse the lids in the saucepan until you are ready to use them. Scrub the beets, then place them in a large saucepan and cover with cold water. Bring to a boil over high heat, then reduce the heat to maintain a gentle bubbling around the edges of the saucepan; cook for about 20 minutes or until the beets are fork-tender. Drain the beets, then cover with cold water. Once they have cooled, slip off the peels (and discard), then cut the beets into quarters. Bundle together the cloves, cinnamon pieces and sliced ginger in a piece of cheesecloth; tie with kitchen twine. Place the spice bundle in a medium, nonreactive saucepan along with the salt, sugar, red wine and vinegar; bring to a boil over high heat, stirring until the sugar has dissolved. Reduce the heat to medium and cook, uncovered, for 10 minutes. Turn off the heat and let the spices steep for 10 minutes, then return the heat to medium so that the liquid is barely bubbling at the edges. 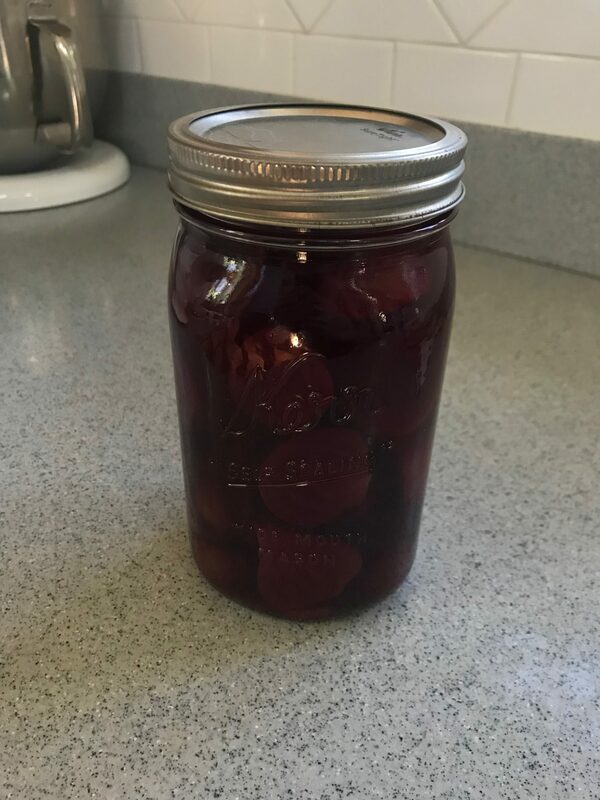 While the syrup is cooking, working with one jar at a time, remove the mason jars from the kettle and pack the beets into the jars. Add 1 star anise and 1 slice of ginger to each jar. Pour the hot syrup over the beets, leaving 1/2 inch of space at the top. Remove any air bubbles by running a long, nonmetallic item such as a chopstick or wooden skewer between the jar and the food, then close the jars using the hot 2-piece lids. Lower the jars into the kettle of barely bubbling water. Cover and bring to a boil over high heat. 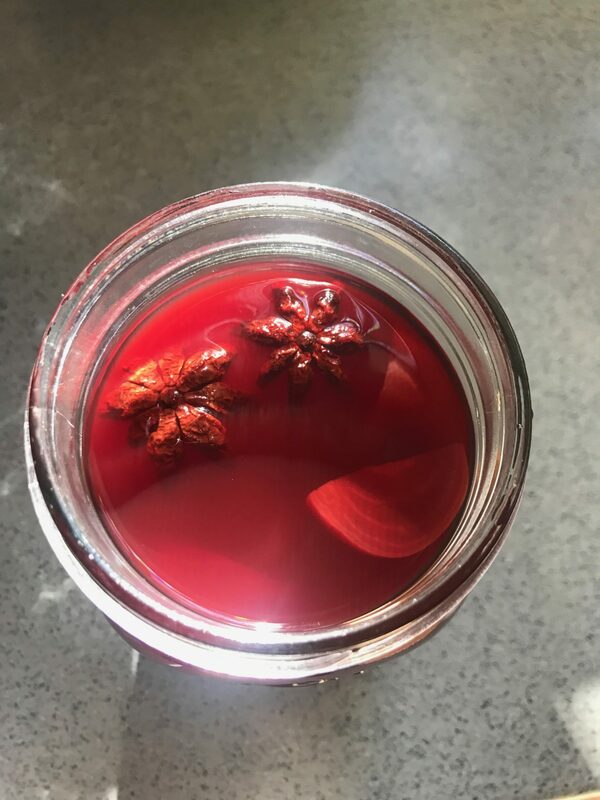 Adjust the heat as needed to maintain a steady but gentle boil; process for 30 minutes, making sure the jars and lids are covered by at least 1 inch of water during that time. Add hot water as needed. Remove the jars, setting them several inches apart on a clean dish towel; let them come to room temperature. When the jars are cool, test for a good seal by pressing the center of each lid. If the lid does not flex up and down, it is sealed. Store in a cool, dry place for about 3 weeks before eating.